It was all going well with the first stable I called. I’ve had a few rejections over the years but this one stung: too heavy to sit on a pony. She may have had to disappoint other people over the years because she quickly gave me the number for another riding stable and we ended what had become, for both of us, an embarrassing phone call. A horse! A horse! Freyathlon for a horse! Reassured, I set a date and a few days later Trace and I drove to the stables. I was nervous. When I was growing up, plenty of my friends had horses and enjoyed nothing better than spending time constructing jumps and grooming their horses. One friend even stopped speaking for a while and would only neigh or whinny. I never got the horse bug. 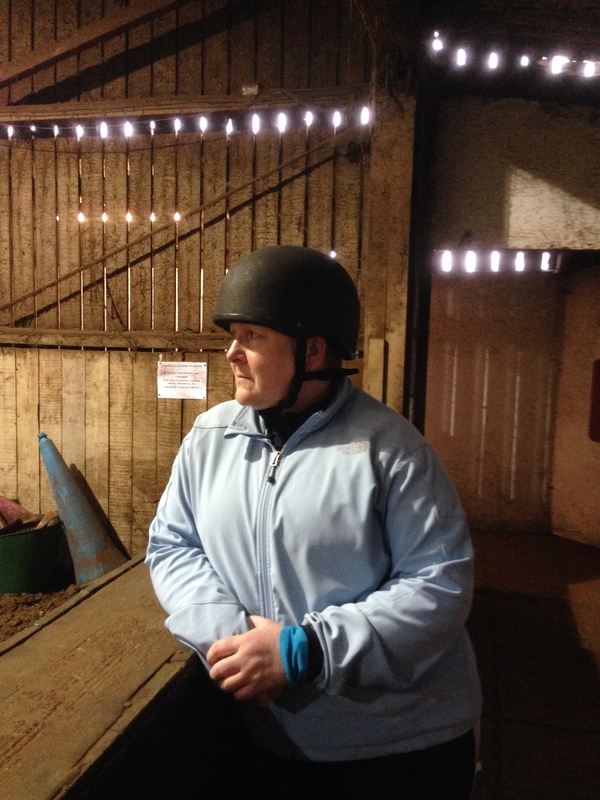 At Mount Mascal Stables, Jennifer helped me find a hat to fit my head and explained, because I was a beginner, I wouldn’t be allowed to go over any jumps. I was relieved. I watched other riders doing circuits, at what seemed an alarming pace, of the indoor arena, and wondered whether jumps would have been so bad. Jennifer asked me to take off any jewellery (in case anything got caught in the reins), and introduced me to my instructor Kyle, who was leading BB. He was huge. Kyle asked when I’d last ridden a horse. I admitted it had been about 18 months (Hello Russell and Isabella) and that while I’d sat on the horse, it had known what to do and had moved without any encouragement from me. I stuck one foot in the stirrup and launched myself at BB. 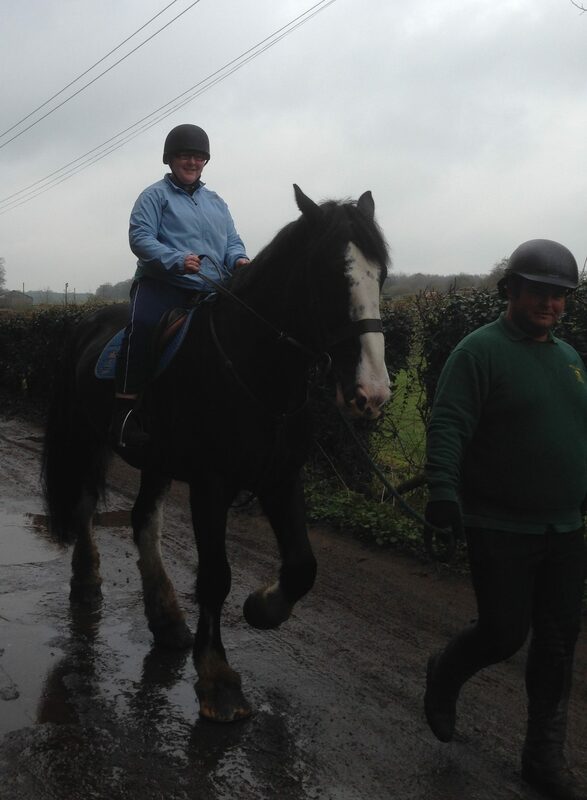 It wasn’t my finest moment but I managed to get into the saddle. Kyle checked the stirrup length, showed me how to hold the reins, and we set off. I tried to concentrate on looking ahead not down, while Kyle kept reminding me to breathe as he led BB around the arena. Kyle told me to use the reins and my leg to encourage BB to turn at each corner but I suspect BB would have known what to do anyway. After a few circuits, Kyle pointed out I was looking less terrified and gave me a few more tips: straighten my back, pull my shoulders back and down, hold my arms at waist height. I did what he suggested and felt more comfortable. I didn’t feel I could say no. 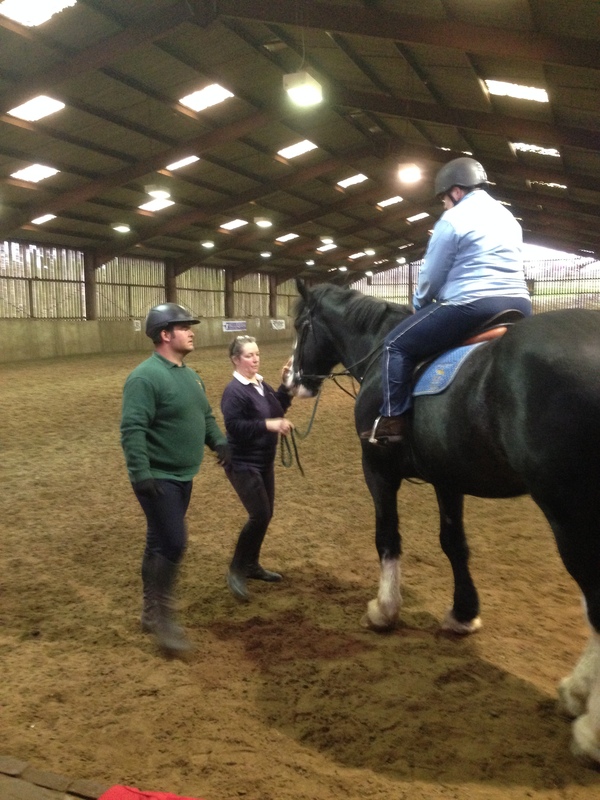 He explained how to do a seated trot, a key feature of dressage, where the aim is to avoid bouncing up and down in the saddle as the horse trots. The trick is to get in phase with the horse so you descend as fast as his back does then, when his feet hit the ground, you’re right there, ready to come back up from the bottom of his stride. It’s all about having a neutral spine and getting more efficient at bending or closing your hip joint. 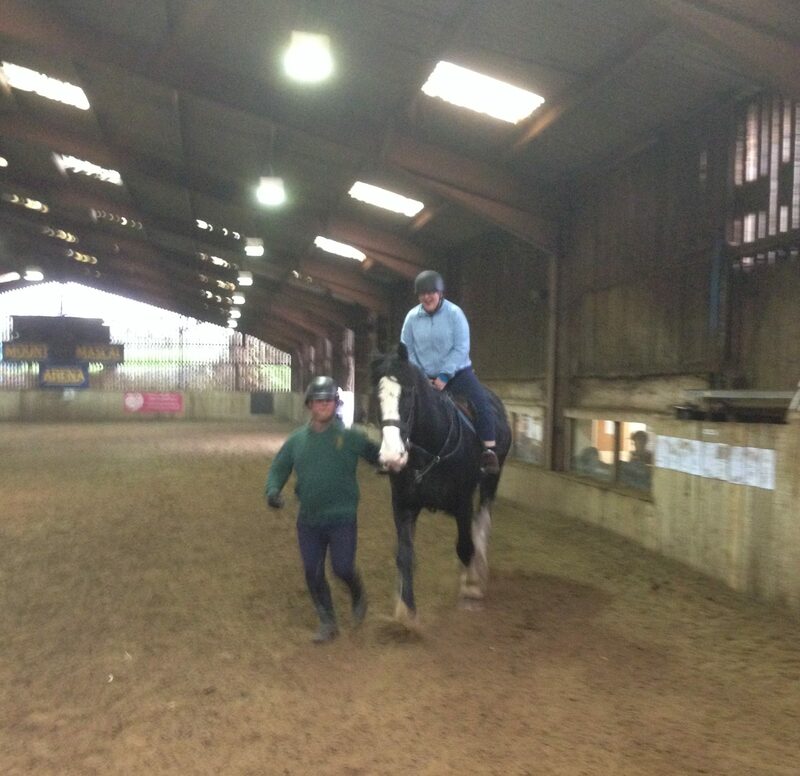 I did as Kyle suggested and used my thighs to move up and forward as BB trotted. 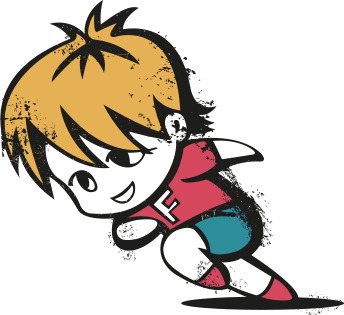 It was easier than the seated trot and I was grateful for all the squats and lunges I’ve done over the years. I started to enjoy myself, even turning corners at a trot. After a few more circuits, we slowed back to a walk then Kyle led us through an indoor jumps arena. We left the indoor arena completely and Kyle took us along a track to a field so I could get an idea of what it was like to be outside on a horse. 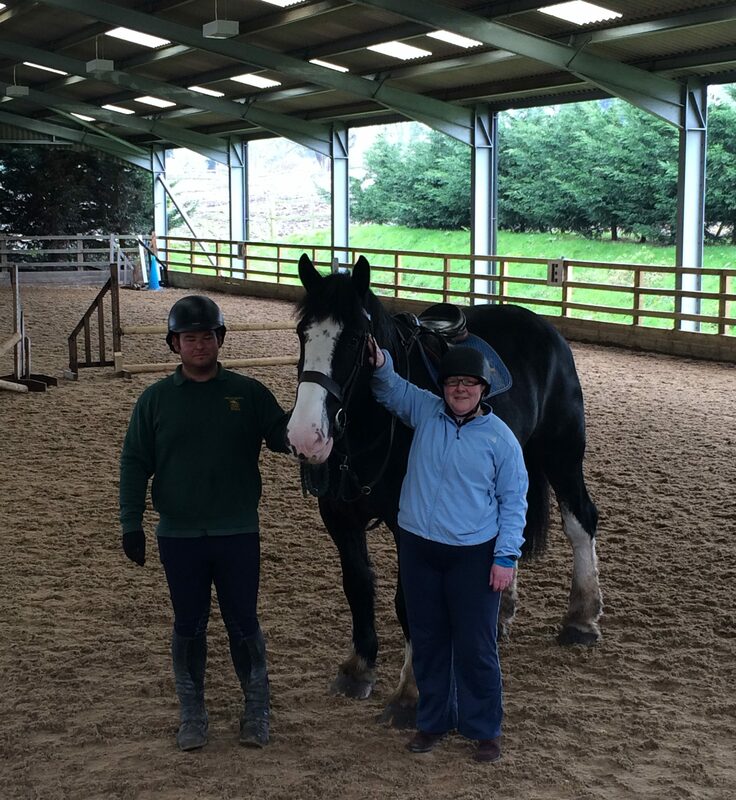 I liked it but I was glad Kyle was still leading BB – the ground looked harder and wetter than in the indoor arena and I didn’t fancy landing on it. 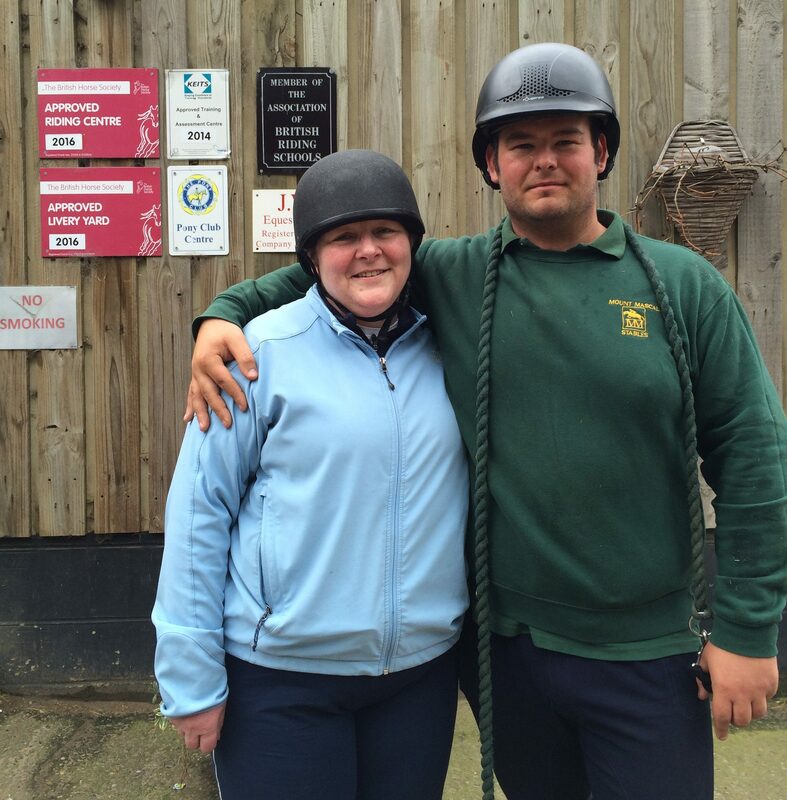 We went back to the indoor jumps arena for the final part of the lesson – the dismount. Under Kyle and Jennifer’s guidance I had a few attempts. Getting my left foot out of the stirrup wasn’t difficult, tipping forward and lifting my right leg up and over BB in a straight line was. Eventually Kyle and Jennifer took pity on me and I slid down the side of BB. It was not dignified. Kyle really helped me overcome my anxiety about riding a horse and I was surprised at how much I managed to do in a short space of time. And I just have to figure out how to try my hand at the other equestrian events!